South Africa's Democratic Alliance leader Mmusi Maimane has urged the 2020 Chairperson elect of the African Union (AU) Matamela Cyril Ramaphosa to dump the quiet diplomacy when handling the Zimbabwean situation. "Nowhere is this leadership required more than in Zimbabwe. There is a crisis of political legitimacy following last year's election results, leading to deteriorating economic conditions and a government imposing military rule on its own citizens." Maimane said. "To date more than a dozen people have been killed by the Zimbabwean government. Quiet diplomacy is no longer an option. Our neighbours need immediate change and as AU Chairperson elect, President Ramaphosa has an opportunity to get stuff done." Maimane said Ramaphosa has been empowered with the capacity to restore order and stability in Southern Africa. "The President now has national and regional power to advance democratic change in Africa. It is his duty to wield it to bring peace and stability in the region. I trust that he will heed this call to action." He said. Maimane has been vocal about the Zimbabwean situation in the recent weeks and has strongly condemned the state crackdown on citizens that left 17 people dead. 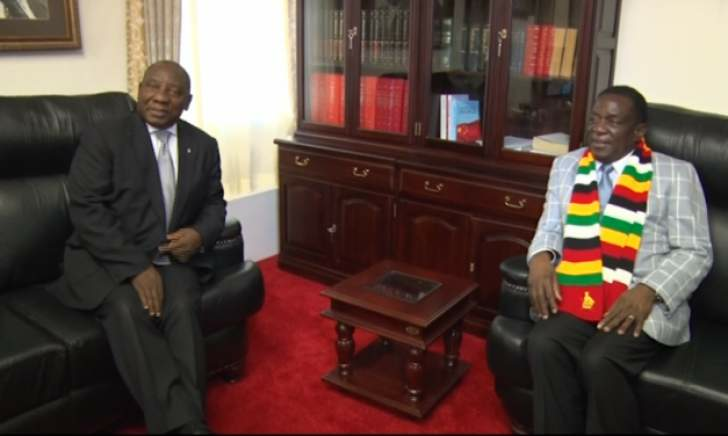 The government of Zimbabwe has warned Maimane of seeking to interfere with the territorial integrity and sovereignty of another Independent State. Maimane was billed to visit Zimbabwe last week but he has been mum on the visit.